I ‘ve lived in Chicago for a while now and when it comes to nightlife, I feel like I’ve got a pretty good idea of the scene. So when I had the opportunity to check out the UniverSoul Circus I was excited. I hadn’t been to a circus since I was a child and the thrill of changing up my Friday night routine definitely appealed to me. The fall leaves crunched underfoot as I paced towards the large, brightly colored tent. In the falling dark of the evening, the lights from within drew the eye as music vibrated through the air. Vendors selling light up wands and other toys called out from around the entrance as families qued up for their tickets. I had thought ahead an procured my ticket online and was thusly able to skip the line. I passed through admission I proceeded to find my seat and join my friends. The air within the tent was warm enough to compel me to remove my winter jacket as we settled in for the show. Over the course of the evening, the UniverSoul Circus showcased performers who specialize in defying death at every turn. From highwire stunts to areal acrobatics, the feats were executed with the kind of precision worth paying to see. The high wire, in particular, stood out as an event that kept me on the edge of my seat. With tense music resonating throughout the tent, it was hard not to gape as each member of the Willy family paced steadily across the open air. Each pass upped the ante until three members, each standing on the other’s shoulders, made their way across the thin rope slowly but smoothly. With each step feeling like it could all go horribly wrong, the crowd’s cheers after they made it to the other side were the result of equal parts amazement and relief. Check out a video of the famous highwire act here. While we’re on the topic of areal acts, Duo Amor had my heart in my throat. The act itself took place to a slower more romantic set of music, which changed the pace of the show and signaled that something special was about to happen. Performed by Hector Alrenares and Beatriz Torres Cuellar, both from Havana, the display was as graceful as it was touching. Both took turns rising up and gliding through the air while the other looked on from below longingly. Finally, when both flew up together, the dance they moved through was spectacular. Staying suspended so high in the air with only your grip on a pole keeping you there is hard enough. Making it look like the most elegant of displays is a whole other level of impressive. The Nomads preform their teeterboard act. A definite highlight of the evening was the performance by the Nomads, a teeterboard using acrobatic troupe from Mongolia. The white of their costumes cut through the dimmed lights as the group took to the ring. The music played sounded almost ceremonial which fit their overall stunning presentation and gave every action a sense of gravitas and weight. By using a teeterboard, the group could launch each other high into the air, flipping in an endless number of combinations. According to UniverSoul Circus, the Nomads are also the only acrobatic troupe to perform a quintuple flip using this method. If that wasn’t eye-catching enough, their ability to flip up and onto each other’s shoulders was the perfect finale. With the final stack featuring 4 people, it’s no surprise they received some serious applause. Having seen their performance, it’s no surprise they were awarded a Golden Lion Cup at the China Wuqiao International Circus Festival in 2017. Things get amped up as the giant beach balls are thrown to the crowd. I entered the experience expecting the clowns, the animals, and maybe even the tightrope walking. What I didn’t expect was the sheer level of audience participation and showmanship UniverSoul Circus featured. More than any other circus I’ve been to, the crowd felt like a participant in the show. It seemed as though there was a real connection between the people in the stands and the people in the ring. A feeling that was only heightened by the fact that the two would intersect frequently. Members of the UniverSoul Circus audience brought onstage to have men vs. women dance battle. On multiple occasions throughout the performance, people would be pulled into the center ring for dance battles. Sometimes it was men vs. women, other times it was kids – either way it really pulled people into the show and made them invested. These bouts got people hyped between acts and made everyone feel like they were a part of the show while they were there. The circus’s unique approach to clowns also went a long way in getting people on their feet. Fresh the Clowns, a trio of “swagged out” performers with amazing hair and even cooler dance moves, won over the audience easily. Often finding kids who like to dance as much as they do, their excited energy got kids even more invested in the show than before. You root for the performers because the show literally makes you one of them. It’s a great concept and it really sets UniverSoul Circus apart from any circus or live-show I’ve attended before. I’d imagine that this would be a great place to bring your kids because the entertainment is like a non-stop roller coaster ride (I’d also guess that it tires them out which makes easier to put them to bed later). By the end of the night, I left the tent with a smile on my face and a heart that wouldn’t stop racing. 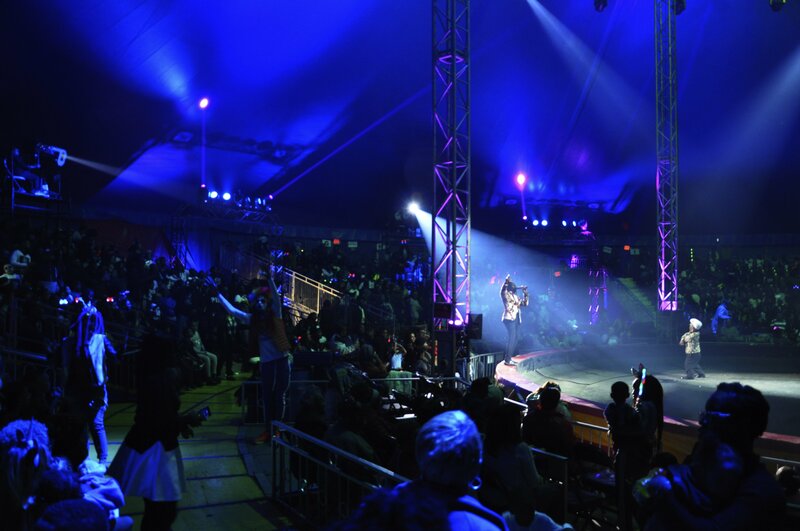 I only covered a few of the numerous acts the UniverSoul Circus had to offer in this article. From magicians making tigers appear out of nowhere, to death-defying motorcycle stunts, to trick riding with horses and camels, the UniverSoul Circus is guaranteed to have a least one thing that blows your mind. Its unique approach to audience involvement, fantastic performers, and fun attitude make it the perfect date night or family night location. Have you ever been to the UniverSoul Circus? What did you think? Let us know in the comments or on social media!